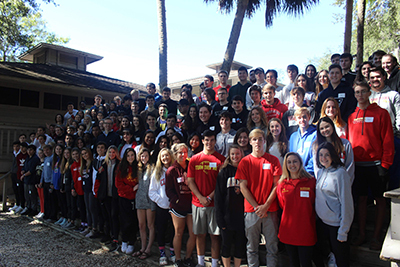 Last week, the class of 2019 participated in the annual Senior Overnight Retreat, “Looking Back with Gratitude – Looking Forward with Hope”, at the DaySpring Conference Center in Parrish, FL. This retreat provided our seniors with an unparalleled opportunity to experience peace and tranquility, stunning natural beauty and a sacred place where spirits are renewed and refreshed. The retreat included Mass; spiritual stations such as Praying the Rosary, a Labyrinth and Stations of the Cross; small and large group discussions and sharing; and presentations by the principal and director of campus ministry.